You have to admit - they have beautifully mysterious eyes. When the Toad came home! With due respect to Mr. Grahame’s famous character, the poor toad is not high on the list of cuddly creatures. Lacking beauty, grace, speed, and just about every other admirable quality toads have been relegated to the realms of witches and hallucinogen seeking crazies in our popular culture. Why the bad rap to begin with? Setting aside for the moment the less than lovely physiognomy of the amphibian, its physiology and behavior are the roots of the problem The noxious properties of toad excretions were well known to ancient people. And unlike frogs that seemed to know their place in the swamps, those rascally toads would periodically burst from stagnant waters and invade the realm of man, sometimes in unsettling numbers. By the Middle Ages toads were strongly associated with witches as familiars, ingredients for spells, and mystical symbols. Put this all together on an ungainly beast that with warts sprouting all over the place and you have a pretty good recipe for unpopularity. 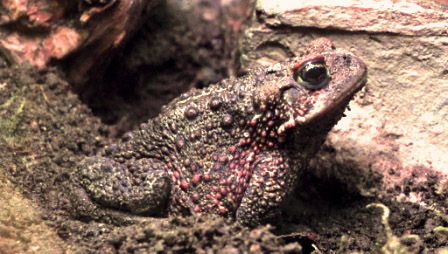 Although they have lost most of their evil association with dark powers toads have retained a poisonous reputation. But this is not entirely undeserved. In general all toads secrete a toxin from the big paratoid glands, those noticeable swellings just behind the eyes of “true” toads. Although in the vast majority of species this is just mildly toxic there are some like the Cane toad that really pack a wallop. A dog or cat that tangles with one of these big toads can be in for a pretty rough time. As for the reported hallucinating effects from “toad licking” (illegal in California, by the way), there is scant evidence for this – but there are many accounts of people getting sick from trying. Moral: Don’t even think about it. Besides, anyone dumb enough to put a toad in their mouth hardly needs to get any higher! The deterioration in modern day toad/human relations can be traced to the saga of the now notorious Cane Toad, Bufo marinus. Found naturally from Southern Texas and into South America, the toad was introduced into Florida, Hawaii, and several Caribbean islands to help eradicate insect pests that were destroying sugar cane plants. The animal, previously known as the Giant Neotropical Toad, did such a good job at this assignment that it acquired its now familiar name of Cane Toad. In 1935 the five pound amphibian was brought to Australia where it was presumed that it would continue the same good work against a certain beetle. Things quickly went astray. The life cycle of the beetle and the Australian climate nullified this biological warfare experiment. But the Cane Toads, oblivious to their mission failure, went on breeding and eating everything else in sight. Mark up another black eye for toad reputation. The dividing line between frogs and toads is murky at best; both in fact belong to the Order of animals called Anurans. But just as there are “true frogs,” so too are there “true” toads. The true toads are classified Bufonidae, a family that includes about 350 species worldwide. Bufonidae are characterized by their obvious warts, and more importantly by the large pair of paratoid glands behind their eyes. Although outdone by frogs in the size department there are toads of considerable dimensions. Tipping the scales at a weight often in excess of five pounds the Cane Toad is one of the world’s largest. For sheer bulk, however, it is outdone by the Giant Asian Toad, Bufo asper. Coming in at nine inches and an average of eight pounds the Giant Asian Toad is truly a big guy. Probably due to our cool wet weather, the Pacific Northwest is not home to a large population of toads. 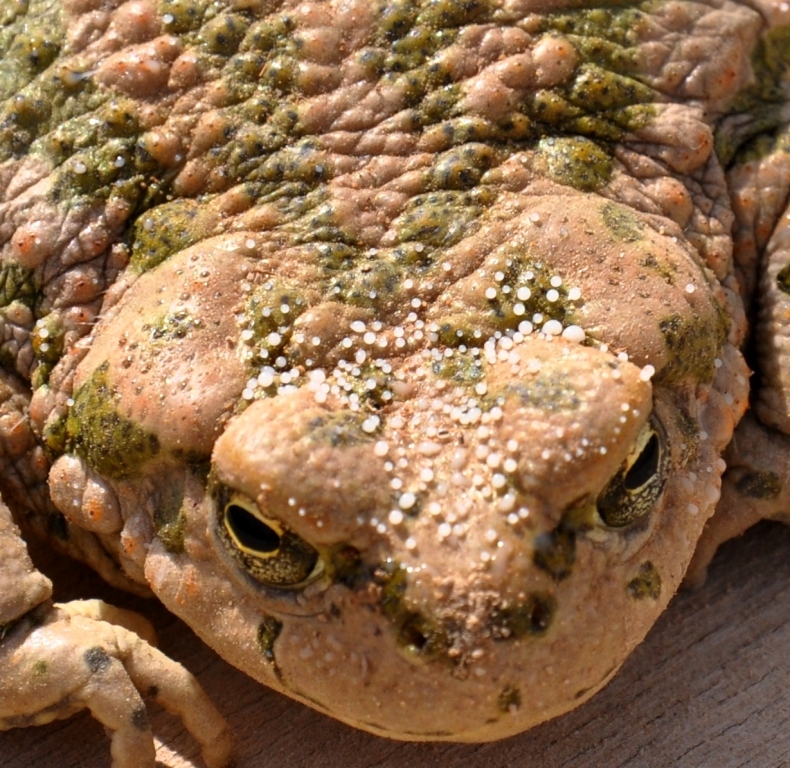 Our biggest representative is the Western Toad, Bufo boreas. Hardly as large as its overseas cousins the Western Toad is still a sight to see at five inches long and one or two pounds. But if you do see one, make a note! This is probably the only true toad of the Pacific Northwest and although not technically considered endangered it’s population has been shrinking. 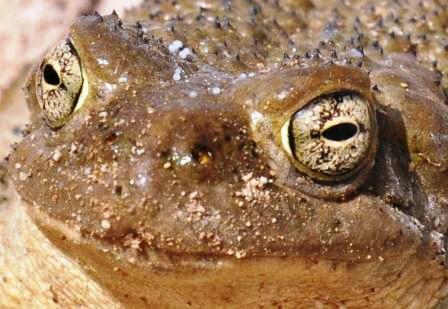 The great Basin Spadefoot Toad, Spea intermontana, while not considered a true toad, inhabits our area. The Plains Spadefoot, Spea bombifrons, extends into western Idaho. Outside of that there is not much for a real toad lover to look forward to around here. But if you head out to the western, drier, part of our region the chances are that you may encounter one or two toady surprises. This article began with the reasons for the less than stellar reputation that toads have among humans. Probably more than any other reason for this unreasonable revulsion is the squat, warty appearance of the amphibian. What could be uglier? But toads have a mysterious characteristic beauty denied to almost every other animal on earth. The next time you encounter one of these ancient beasts look beyond the obvious. Look close, and look at the animal’s eyes. Composed of black, copper, and gold mystery the eye of the toad is an extraordinary possession; a unique gift from the Creator to remind us of the beauty in all creatures. For it’s Toad’s- great- day!